One thing Trek fans love to do is make their own Star Trek movies. Some Star Trek videos are awesome. Some Star Trek videos are terrible. But one video is so bad Congress got involved. 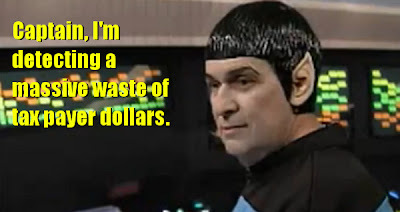 It seems that Congress got wind of a Trek parody made by no less than the Internal Revenue Service for a 2010 training conference. The video outraged Congressman Boustany, Chairman of the Ways and Means Oversight Subcommittee. He sent a letter demanding that the IRS account for all the expenses for the video. At first, the IRS responded with a simple statement that they would provide a copy of the video and that the video "was used to train taxpayer assistance employees in approximately 400 locations across the United States, saving an estimated $1.5 million as compared to the potential costs to train these employees in person. We believe the combined production costs, including participant staff hour costs, for the 2010 video segment and the introductory segment of the 2011 training series were approximately $60,000." Boustany wasn't satisfied by their response, saying that offer "'to make both videos available for viewing' is not responsive to the original request." On Friday, the IRS released the video, along with a statement admitting that the video "does not appear to have any training value." I'm not one of those people who foam at the mouth over the use of tax money. If it wasn't used for this, it would have been used for something else. Personally, I feel the video's real crime is that it's monstrously unfunny. What do you think of the video? Are you upset about the use of tax money? Or is it just harmless fun? Let us know in the comments. Caught the IRS red handed! That is too funny. 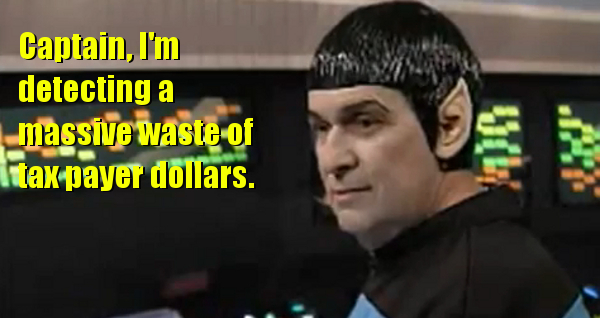 At least if they were going to waste our money, make a good Star Trek video.